Hoi An Tour Deals aren’t hard to find, and why would they be? Hoi An is a city in Vietnam’s Quång Nam province, and is the location of Old Town Hoi An, one of the best-preserved examples of a southeast Asian trading port in the world. There is much to see and do in Hoi An, and as with many destinations in the region, there is hundreds of websites plastered with information on sights and locations in Hoi An. That’s why we’ve decided to write up a few things to look for in Hoi An, to get your getaway kickstarted. One of the interesting traditions of Hoi An is based not around the calendar month, but rather the lunar cycle. On the 14th day of each lunar month, the limited electric lights in the old town are extinguished and replaced with traditional lanterns instead, in an event known as the Lantern Festival. Purchasing a lantern at the festival is around fifty cents, and many vendors sell them. Hoi An has been called “the cheapest place in the world for custom made suits” before, and while the tailors might not be the absolute best in the world, they are easily good enough to make a decent suit custom fit to your body size and shape for as little as $100. If you find yourself in Hoi An in need of a suit, don’t look past Miss Forget-Me-Not, known as “The best tailor in Hoi An”. Old town is the by far the biggest attraction in Hoi An. It’s a 15th -19th Century trading port incredibly well preserved and is made up of 1,107 timber frame buildings. There is a Covered Japanese Bridge dating back to the 18th century, and it’s original street plan remains. It is the only such town from that time period that has remained unmodernised, and as such, it has been made into a UNESCO World Heritage Site. The town is still occupied and is still used as a trading port and a place of commerce. Quan Cong Temple is dedicated to Quan Cong, a chinese general. He is worshipped here, and is said to represent loyalty, sincerity, justice and integrity. A bowl is struck when someone makes an offering, creating a low reverberation throughout the air in the temple. Constructed in the 1590’s by the Japanese community within Hoi An, this bridge was used to connect the Japanese and Chinese quarters. The decorative architecture has remained the same over the centuries since, and a pair of monkey statues guards one side of the bridge, while a pair of dog statues guard the opposing side. It is theorized that this is because the bridge’s construction was started in the year of the monkey and finished in the year of the dog, however it is also theorized that the statues are there as reminders that many of the Japanese emperors were born in the year of the monkey or dog. There is a small temple built into the bridge’s northern side. However unlike the bridge, this temple requires a ticket to enter, and as such is not free. 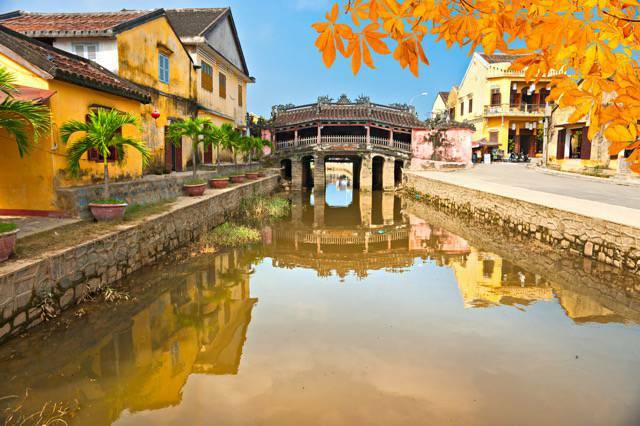 Hoi An is a historic city, and has many things to offer. From suits and wonderful food, to lantern festivals unlike anything else, and a town nearly 500 years old that you can still walk around in, Hoi An is worth seeing thoroughly.